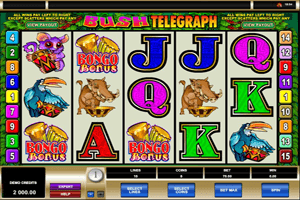 Bush Telegraph is a 5-reeled video slot machine that is themed around the jungle and the wildlife. The game will allow players to take a trip to the jungle as they enjoy the company of the animals and the beautiful nature. Players will get to enjoy this experience as they spin the reels of game after placing bets on the 15 betting lines that the game has in store for them. They will be able to activate the number of lines they want by clicking on the Lines button at the control panel of by clicking on the paylines themselves. The other two betting options are the number of coins per line as well as the value of these coins. These options are found under the reels at the control panel of the game. Play Bush Telegraph Slot here. The game’s symbol include different animals that live in the jungle such as a Koala, a parrot and a wild boar as well as cherries, bango drums, the wild symbol and poker card symbols. When players click on View Pays, they will be able to check out the different payouts and the special icons of the game. There are three special symbols. The first one is the wild icon that will replace all other symbols and also gives the highest line payouts. The scatter cherries can trigger the free spins round where players can win up to ten free spins and lastly, there is the Bango bonus symbol that can activate the bonus round of the game.